Somewhere in your travels, is there a place you go that never disappoints you? Somewhere that, the first time, caught you by surprise, widened your eyes, and left a stamp on you so you knew you’d be back? Somewhere that, each time you go back, you walk a little slower, breathe a little more loosely, and consciously feel just…happy? 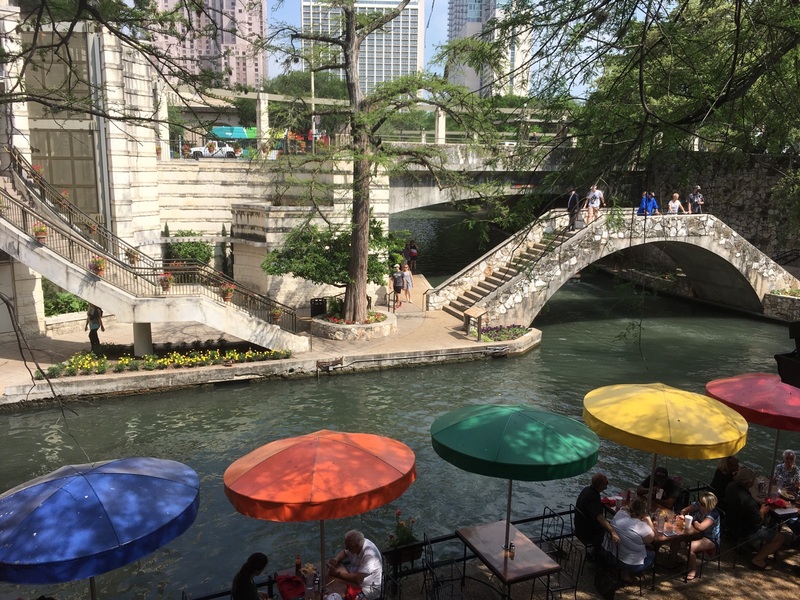 For me, one of those places is the San Antonio River Walk. I’ve been there three times, maybe four. The numbers blur, but the feeling doesn’t. When I’m there, the world feels right. Robin Hood and I went to San Antonio to attend a funeral. It seems wrong to say I “enjoyed” the trip, but I’m glad we went. The gentleman who passed taught Robin Hood how to skin a deer, among countless other good deeds and kindnesses, and I got to meet a lot of his family. His son is one of my husband’s best friends, and getting to know he and his wife – and their two kids – was a true gift. And while the occasion was a sad one, every part of the memorial was beautiful. We spent most of our time with the family, but we did visit the river walk. The first time was after dinner downtown at a place called La Gloria, where I learned how ignorant – and under-appreciative – I am of authentic Mexican food. A big group of us went, and after filling up on the deliciousness, a smaller group ambled toward the river. The stretch of river walk we covered that night was up (down?) the river from its busiest section, but still. The air was warm, the breeze was cool, and honeysuckle perfumed the air like something straight from heaven. The second time was for lunch one day, after a visit to the Alamo. NOTE: If you’ve never visited the Alamo, do so as soon as possible. Yes, it’s smaller than many people expect, but it’s a piece of American history that should never be overlooked. I bought a copy of the “Travis letter” – William Travis’ eloquent plea for help in the days before the battle – to hang on my wall, as a reminder to always do the right thing. Back to the river walk. After the Alamo, we strolled along the downtown section of the walk, soaking up the scenery. Soon our stomachs got the best of us and we stopped at the place that drew our attention the most: Casa Rio, established in 1946. We ate outside right next to the river, laughing at the calm relentlessness of the pigeons and ducks looking for handouts. We shared tres leches cake for dessert, and got serenaded by mariachis. Afterward, we paused at the top of one of the footbridges that arch across the river, and just looked at it all. We’ll be back, San Antonio. I too have visited the Riverwalk and the Alamo three or four times over several years. Travis’ call for fire letter resonates with me, also. It is a beautiful place that remembers the past while celebrating the present. Yes Jo I am sorry but I made an error by quoting from an early supposed leak from a Press Release which had Ball at Brkaafest and Price at Mornings. It did not even mention Vizard being involved anywhere in the lineup. I had not heard any radio prior to posting otherwise I would have had the official lineup. Anyway as things turn out we have at least one of them but here is hoping that maybe Oldfield will turn up at 2UE. Nice piece. You could write for a travel magazine.